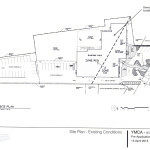 A Pre-Application Conference has been scheduled to discuss a redevelopment of the YMCA at 6036 SE Foster Rd. 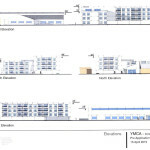 The project will include a 58-unit residential building to the rear of the site, and a separate building that will house a YMCA Daycare and possible Community Service Use fronting on Foster Rd. The existing building, which would be demolished, was built in 1957. The applicant listed on the public notice is Angelo Planning Group. The drawings were prepared by Leeb Architects. The Pre Application Conference is scheduled [PDF] for May 28, 2015 at 10:30 AM. 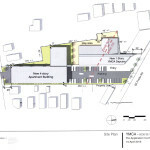 A Type III Planned Development Review is expected to be required for the project, in order to allow the multi-dwelling residential development and other commercial and institutional uses in a single-dwelling zone. This entry was posted in 6036 SE Foster, Angelo Planning Group, Creston-Kenilworth, Leeb Architects. Bookmark the permalink.